Nothing is quite like a new Molly Nilsson album, and no Molly Nilsson album is quite like Twenty Twenty. More personal, more introspective and more than ever distilling a full range of emotions into song, Twenty Twenty could be your life. “After a cancelled flight I found myself stranded at the Tokyo airport overnight. Between my interrupted bench naps the surroundings found their way into my dreams, particularly the big banners in the departure hall stating: 2020. Not aware that they were announcing upcoming Olympic games, my imagination wandered. 2020, a leap year. The year of the rat, the election. Perfect vision. The year of hindsight. The repetition, the ritual of the superstitious. A spell cast on the approaching future; not yet there, but close enough to be seen with full clarity. The year itself seems to draw a circle around its followers, as to protect anyone who dares enter. Twenty-Twenty is Molly Nilsson’s 8th album; the latest opus of an artist in a constant state of development and strength. Twenty-Twenty is about emerging from the husk of your old self, about binning the chrysalis and daring to stand up both to power, and also to your own limits. In 2018, we see the climate changing, democracy crumbling, inequality and injustice erupting. 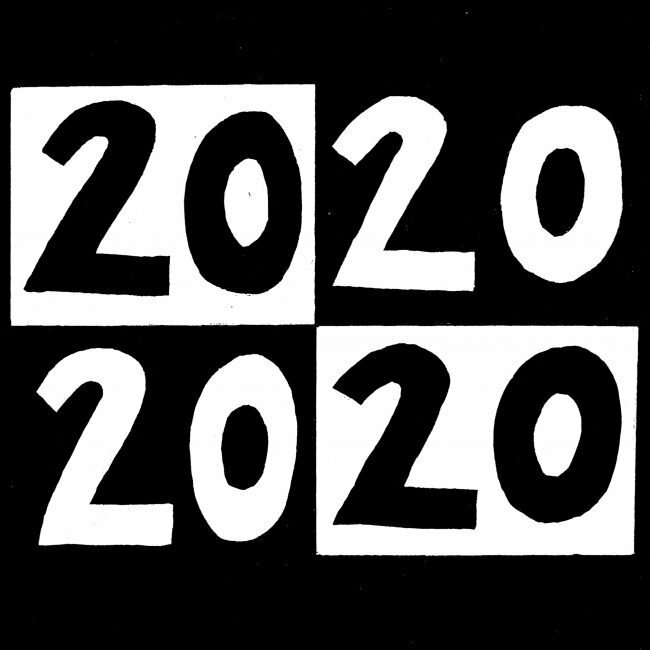 2020 examines the near future, seeking out clarity, reflection, renewal and opportunity. It contains anthems so tall as to induce vertigo, leaving the taste of Euro Dance in your mouth, albeit without a four on the floor beat. Here, the pop auteur is haunted by the late Prince, channelling Courtney Love and Lou Reed, anger and love. Recorded as ever in her own Lighthouse Studios and co-released with her imprint Dark Skies Association, the record is consistent in strategy and approach to past releases, yet on 2020 Nilsson pushes the limits of what can be said in the scope of a pop song even further. Despite working with used keyboard sounds that evoke memories of a distorted past, the sound is distinctly contemporary. The record drifts between playful punk methods and hi-fi ideas, strikingly clear through the fuzz of a surrounding world painted with reverb. Rather than gracefully dissecting, 2020 rips apart personal neuroses and insecurities, looking for the roots of issues and the equation that, when solved, will produce the future. “I don’t care if the world is through, every night is new,” 2020 erupts with fist-in-the-air empowerment, a realization that if we’re all alone down here, we can still make it. Every Night Is New is a personal and societal manifesto, a slogan comprising the different layers that make this record Molly Nilsson’s most personal, evocative and emotionally packed in years. First single Serious Flowers is a naked confessional trance hit stripped of its beat. Centred around broken trust and friendship, Nilsson sings over suspenseful synth strings with a vocal delivery so inexact and honest, its vulnerability seems almost unaware of itself. Although very much in the vein of Nilsson’s production style on her recent albums, Days of Dust, accomplishes escape and breaks free from the past. There’s a carpe diem immediacy to this fast-paced Rock Song that belies Nilsson’s near-iconic self-contained delivery: “Like I had just been saved from a burning building of desire, I got back up and I ran right into the fire.” It’s so immediate, and speaks so perfectly about the nature of desire, that you wonder how you’d never thought about it like that before. The themes on the album are submerged in the inner life, lucidly dreaming with one eye open, fixated on the external world and its growing pains. Nilsson turns inward and seeks answers to questions imposed by physical existence, examining one’s own responsibility in the face of climate change (A Slice of Lemon), the political depression of society (Gun Control), and the struggles with drinking, between euphoria and despair (Blinded by the Night). The serious topics aren’t met with hopelessness; the tone suggests defenceless optimism and a tight grip on desire. This time around, we’re not examining the past with Molly Nilsson, we’re becoming who we want to be. We’re exploring the future, accepting who we are, clear eyed and with perfect vision, near and far sighted alike.